Nice CD from Dub Store Records based in Tokyo, Japan. 15 tracks produced by Winston Riley between 1968 -1969. Featuring Dave Barker, The Techniques, The Shades and The Mad Lads (not to be confused with the USA Stax records recording vocal group). Winston Riley started his career as a singer with an enviable track record, having formed the Techniques in 1962 and hitting the top of the charts two years later with the splendid 'Little Did You Know' for Duke Reid's Treasure Isle label. 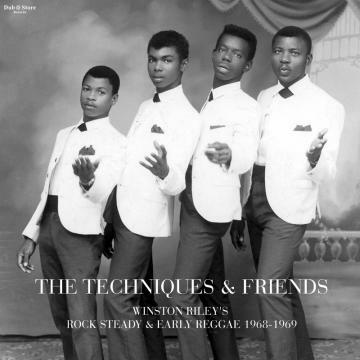 When the frantic ska beat slowed down and turned into rock steady Winston remained the only permanent component of the Techniques, arguably Jamaica's finest vocal group. Winston Riley was at the forefront of the Jamaican music business for over forty years, singer, songwriter, arranger and producer. He had been making plans for a new studio and museum in his Orange Street record shop right up to his death in 2012. Terrific black & white photograph on the CD cover of the Techniques. Booklet notes by Chris Lane. Issued on Dub Store Records DSR CD 016 Japan.